The New York Times (January 24, 2012) described the current debate about bereavement and depression. A recent paper in World Psychiatry (volume 11, pp 3–10, 2012) suggested that people undergoing loss (through death or other tragedy) be excluded from a clinical diagnosis of depression. Other mental health workers, however, argue that grieving individuals be considered clinically depressed and be treated. This recommendation may well be included in the latest edition of the Diagnostic and Statistical Manual of Mental Disorders (DSM) published by the American Psychiatric Association. Eric Maisel, who holds a PhD in counseling psychology, takes aim at this propensity to medicalize all aspects of behavior. In Rethinking Depression, he launches a strong attack against the way depression is currently diagnosed and treated. He explores the criteria used to classify an individual as depressed and finds these criteria to be vague and non-descriptive. To make his point, he looks at a person who is simply bored with his job. By careful selection of terminology, a diagnosis of depression can easily be reached for this individual. In dismissing the “biochemical imbalance” approach taken by most mental health professionals, Dr. Maisel shortchanges the reader by failing to do any exploration of the vast literature dealing with such issues as serotonin deficiencies (supposedly corrected by these antidepressants). While he is on solid footing with his thinking that the possible chemical changes in the brain are the result of stress or grief (and not the cause of one’s depression), he ignores some specific issues such as seasonal affective disorder (SAD). This syndrome does have a biochemical basis and is definitely linked to shifts in sunlight and in brain melatonin. What does Dr. Maisel recommend? He has little use for traditional psychotherapy and he may have some grounds for this position. Several studies have shown that depression in a significant fraction of the population can be dealt with simply by talking to a trusted friend. His basic thesis is that what passes for depression is simply a feeling of unhappiness: with one’s job, with one’s friends, with oneself. To deal with this unhappiness, he advocates involvement with what he calls noimet¬ics, “a new phi¬los¬o¬phy of mean¬ing that artic¬u¬lates the par¬a¬digm shift from seek¬ing mean¬ing to mak¬ing mean¬ing.” (from author website). He advocates a multistep plan for thinking through these issues and developing a strategy for improvement. Interestingly enough, for all his displeasure with traditional psychotherapy, his approach in many respects resembles the types of issues that could (and should) be raised by more traditional mental health providers. Noimetics joins a number of newer approaches to dealing with depression. Some of the more creative are a smartphone that reads your mood, a medicine bottle that tracks when you last took your antidepressant pill, and a “virtual human coach” to work on-line in a game fashion to help adolescents overcome depression (all reported in Medical News Today, February 9, 2012). 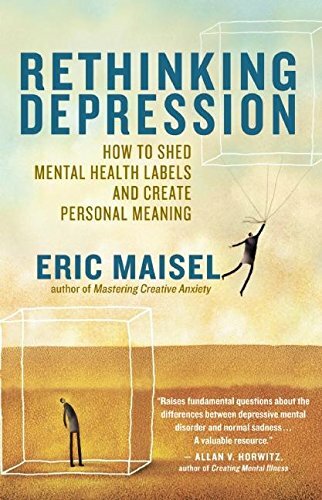 Rethinking Depression: How to Shed Mental Health Labels and Create Personal Meaning by Eric Maisel explores some significant issues with the way depression is currently diagnosed and treated. Not everybody will agree with Dr. Maisel’s solutions, but he is definitely asking the right questions.